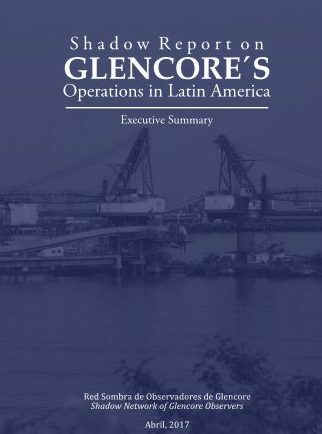 In 2012 a group of organizations from several countries began follow-up, oversight, and information collection on the impacts produced by Glencore’s Latin American mining operations. This alliance was strengthened in 2013 under the name Shadow Network Glencore Observers, currently made up of ten non-governmental organizations located in Argentina, Germany, Bolivia, Belgium, Colombia, Peru, and Switzerland. As the Shadow Network of Glencore Observers, today we have been able to carry out an initial exercise in follow-up, documentation, and critical analysis of the company’s operational sustainability in Argentina, Peru, Colombia, and Bolivia. Since we are not organizations specializing in corporate research, but instead our background is with communities and in the field, we have used that experience to establish the most serious impacts and damages in nine of Glencore’s mining operations based in our countries. For years we have seen that Glencore does not provide in-depth information to the world in its sustainability reports. lt is selective, incomplete, and sometimes contradictory. The reports lack structured texts and are more concerned with presenting insufficient and out of context numbers and corporate initiatives than showing the real consequences of their mining operations. The company promotes a prosperous vision of the extractive industry, hiding the true scope of its business structure, and the serious negative impacts for host communities and governments. Many will ask, why write a shadow report on a transnational company of Glencore’s scope and size, which has proclaimed itself to be an open door company implementing due diligence and best practices in all its activities. In several Latin American countries, the territories and populations adjacent to the company’s raw material extraction projects, have been directly affected by these operations and to date, have not been recognized, much less achieved comprehensive redress from the company. To understand this report’s importance, it is necessary to know: What is Glencore? Why are its activities the object of this investigation? Glencore is a transnational company whose operations currently include the entire supply chain, transformation, storage, and transportation of raw materials in three principle business sectors: metal­mineral, energy, and agricultural products. The diversification of its operations gives the company an incomparable market advantage. lt is the fourth largest mining company in the world and fourth globally in the trade of raw materials. For over two decades, Glencore has been conducting mining operations in Argentina, Bolivia, Chile, Colombia, and Peru, occupying the top positions in the continental production of silver, copper, tin, zinc, gold, and coal. Glencore controls and has stock in the largest mineral reserves and carries out large scale investments like few other companies in the region. Investigating Glencore’s operations in Latin America has allowed us to demonstrate that the region provides the company with a very lucrative business. lts operations function using a hidden network of tax havens, through which it buys and sells to its subsidiaries and third parties, it incurs debt, fixes transfer prices, and saves on tax payments using elusive maneuvers. These operations hide the financial flow of capital and commodities, and prevent governmental fiscal control causing asset damages to the nations. Glencore bases this corporate model on permissive contractual systems, insufficient tax requirements, and commercial treaties that protect investment. This business network has generated serious impacts and environmental liabilities in priority conservation ecosystems: they use massive amounts of water, and produce innumerable waste and contaminate discharges with serious repercussions on biodiversity and water balance, uncertain impacts for human health, lost sources of livelihood for local communities, and displacements due to contamination and economic factors. This research denounces the existing deficit in the comprehensive reparation of communities in affected regions, a lack of conclusive health studies, and innumerable environmental investigations and sanctions against the company. In addition, high levels of social­environmental conflicts, few economic opportunities, and a very low quality of life are constants in areas adjacent to Glencore’s operations. Company actions to mitigate their activities‘ effects on climate change are insufficient and instead have worsened the local environmental crises. The overuse of water resources presents a very risky scenario of water shortages for the coming years in the studied provinces. This allows us to ask the following question: Why would a company with Glencore’s experience and capacity not have adequately responded to the human rights complaints and demands from communities adjacent to its operations? We do not have an answer to this question. With the aim of providing more detailed and precise information than what is included in the company’s sustainability reports, this report presents the results of a rigorous investigation that took over five years, by means of which four case studies were constructed on the company’s operations in Argentina, Bolivia, Colombia, and Peru. In each case, there is information related to corporate and environmental aspects, the open door policy, legal and administrative subjects, and finally, a series of recommendations and petitions directed at Glencore, as well as different government entities in the studied countries. Shareholders, stakeholders, funders, and governments who are part of the transnational’s value chain should take advantage of this report so they have information beyond what is officially produced by the company, and can evaluate, within their commercial decisions, the voices and recommendations that come from the communities and territories, taking into account the violation of rights, environmental destruction, and economic damages that these territories have faced for decades. As the Shadow Network of Glencore Observers we encourage other organizations, platforms, social movements, and communities to work in coordination on corporate control and to exert social control and oversight from their regions to denounce major abuses of which they have been victims. Companies and states have yet to document, recognize or redress the majority of impacts and damages generated by these activities.